The Boys in Green will need to worry about the difficult task of beating Italy first. Ireland could face hosts France if they beat Italy. NOT MANY PEOPLE fancy Ireland to progress tonight, but should they secure the improbable victory over Italy needed for qualification, there are a number of potential scenarios they could face. Firstly, there is still a minor possibility of Ireland finishing second in the group. In addition to the Boys in Green beating Italy — it would require a Sweden win against Belgium in the other group game taking place tonight. Moreover, Ireland would still need a better goal difference than the Swedes to secure second. As it stands, Ireland are at -3 while their opponents are on -1, so the Boys in Green would need to beat Italy by a few goals and hope Sweden can only edge past Marc Wilmots’ side. This highly unlikely second-place finish would see them play the winner of Group F, which looks like being Hungary as it stands, though Iceland or Portugal could yet beat them to top spot. That particular fixture would take place at the Stadium Municipal, Toulouse on 26 June. In the more probable scenario, a win over Italy would see Ireland come third. Consequently, the Boys in Green, would most likely face a trip to Parc Olympique Lyonnais, Lyon, to face France on Sunday. Alternatively, they could also play Spain’s conquerors Croatia in the Stade Bollaert-Delelis, Lens on Saturday. How Ireland’s opponents are determined depends on which team qualifies from the other groups as best third-place finishers. Martin O’Neill’s side will likely be keeping an eye out this evening to see if the third-place team from Group D or F advances. In order for it to be the team from Group D, Hungary, who have already qualified, would need to pull off an unlikely victory against third-place Portugal in Group F.
Otherwise, the team from Group F will likely advance now as one of the best third-place sides, meaning Ireland would face a daunting game against hosts France. Email “Here's who Ireland could face if they qualify for the last-16”. 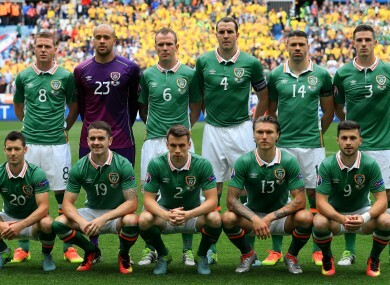 Feedback on “Here's who Ireland could face if they qualify for the last-16”.